VEVEINC.COM | VE-VE Inc. Home Page | VE-VE Inc.
With over 45 years of manufacturing marine products, we have the reputation of top quality and durable AMERICAN MADE Marine products for complete customer satisfaction. Have fun browsing our site and feel free to contact us using the "Contact us" link located under "Help" on the left hand side of this screen. Boat Trailer Post Guide-Ons, T-945-G; 47" tall, 1 PAIR (1 ea. shown). Galvanized finish model, for SALT WATER USE! ( NOTE: GOLD ZINC PLATED MODEL SHOWN. ) 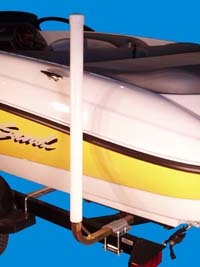 Use on boat trailers or boat lifts/hoist. Click On "DETAILS", Note our features that the others don't have, along with product info. & pictures. Steel tube ONLY 6" shorter then PVC tube. Welded brace at tube form for strength. 14 ga. steel tube, NOT 16 ga.
PVC tube sets on Ring Base, NOT jam into joint. Personal Watercraft Ramp, DDA-PW17; 16 ft. long model has Aluminum tubular construction & accommodates the longer 2-3 seat PWC models on the market. 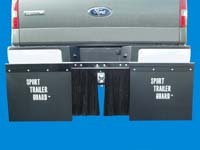 The "Sport Trailer Guard"™ has 2 ea. 24" sq. mud flaps and is ADJUSTABLE to your tow vehicle width. The SG-224 is a "REMOVABLE" mud flap assembly. NOTE: Pictured with OPTIONAL SG-230; "Center Skirt".